Note: mentioned versions can be not up-to-date. Please checkout extension's CDB page or GitHub repository for currently supported versions. Please note that previous releases are not supported and newer versions contain security fixes. Upload and install extensions without using FTP! 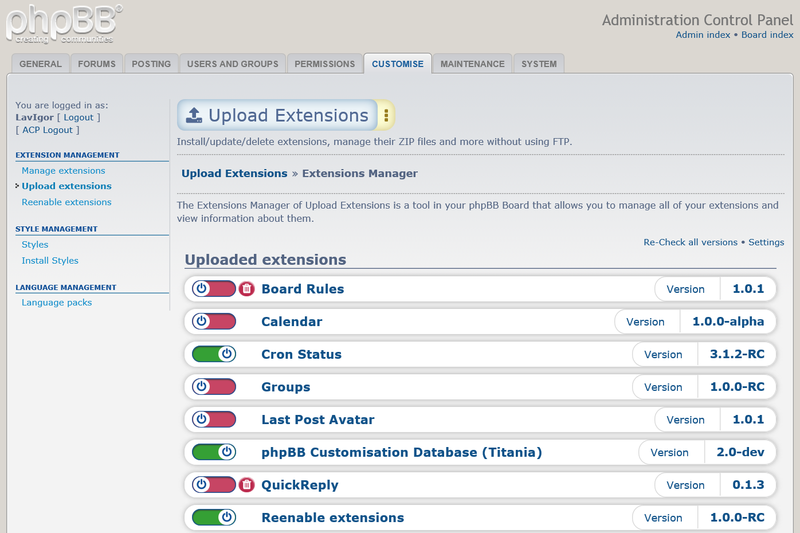 Manage extensions more quickly and effectively! Use additional features: manage ZIP packages, view file trees, download proper ZIP packages of your extensions and more! 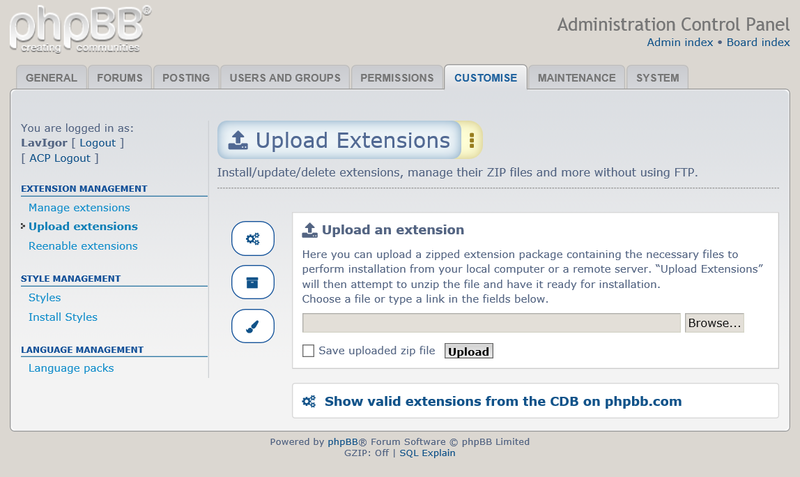 Compare the features of the new version of the extension to available features of phpBB core. The full list of features can be found on extension's webpage. I have created Upload Extensions Updater so that any version of Upload Extensions can be updated to the current latest version without FTP. Make sure that Upload Extensions is already installed on your board, The first installation is possible only with standard installation method. 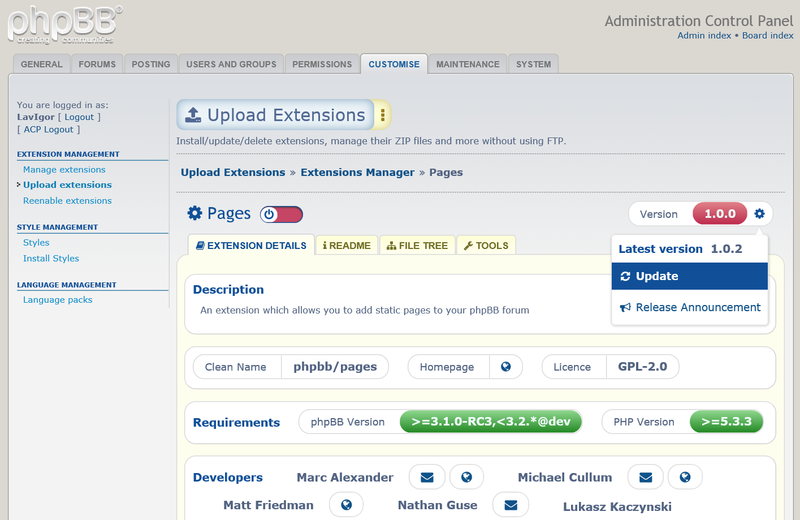 Upload the new extension Upload Extensions Updater (download link, GitHub repository) using Upload Extensions in the ACP. Enable Upload Extensions Updater (click on the corresponding link). Navigate to Upload Extensions Updater in the ACP (the link to it should appear in the same section as the link to Upload Extensions). Check out the available updates and click on the "Update" button. Other screenshots can be found here. Last edited by LavIgor on Fri Jan 22, 2016 7:16 am, edited 14 times in total. Interesting, I think this is useful Extension. Good work and as I have said before this should be part of the core. When using the "tree" to view the files you have to click on the folder name to expand/collapse the tree. My natural instinct, and I suspect others, is to click on the folder icon - can this be changed? david63 wrote: Good work and as I have said before this should be part of the core. david63 wrote: When using the "tree" to view the files you have to click on the folder name to expand/collapse the tree. My natural instinct, and I suspect others, is to click on the folder icon - can this be changed? OK, we can change it. I have discussed this with John. Later we can move to another repository without an underscore. The version number is according to phpBB version number. I don't mind this approach, but I told John that it may be incompatible with the requirements. Wait a little - we won't have those small bugs in the final release. Do you mean that the extension is useful for you? LavIgor wrote: The version number is according to phpBB version number. 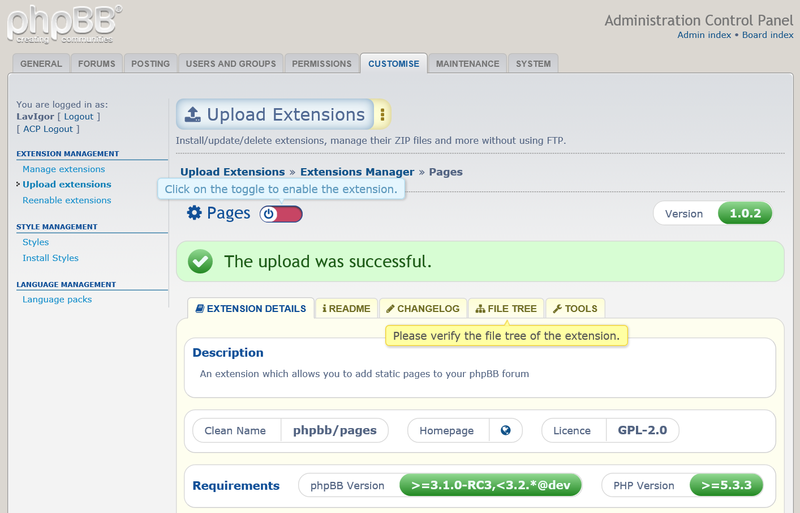 Unless I have missed something extensions have their own version number and do not use phpBB's version - that is only required for compatibility. Yes, you really shouldn't be using the same version as phpBB itself for your extension. Although I guess ext authors are free to use the version numbering they want, I think it would indeed be confusing to use the exact same naming convention as phpBB. If I were you guys, I would simply start with version 1.0.0, so you can update it whenever you want and don't need to keep some weird pace with the core. Additionally, you should probably remove "phpbb/phpbb": "3.1. *@dev" from the composer.json "require", since we now use the soft-require version only. PayBas wrote: If I were you guys, I would simply start with version 1.0.0, so you can update it whenever you want and don't need to keep some weird pace with the core. I use this type of versioning for my personal extensions - see "Reenable extensions". PayBas wrote: Additionally, you should probably remove "phpbb/phpbb": "3.1. *@dev" from the composer.json "require", since we now use the soft-require version only. It was added for compatibility with early phpBB 3.1. *@dev versions. Last edited by John P on Wed Aug 13, 2014 11:04 am, edited 1 time in total. That's why I suggested 1.0.0. 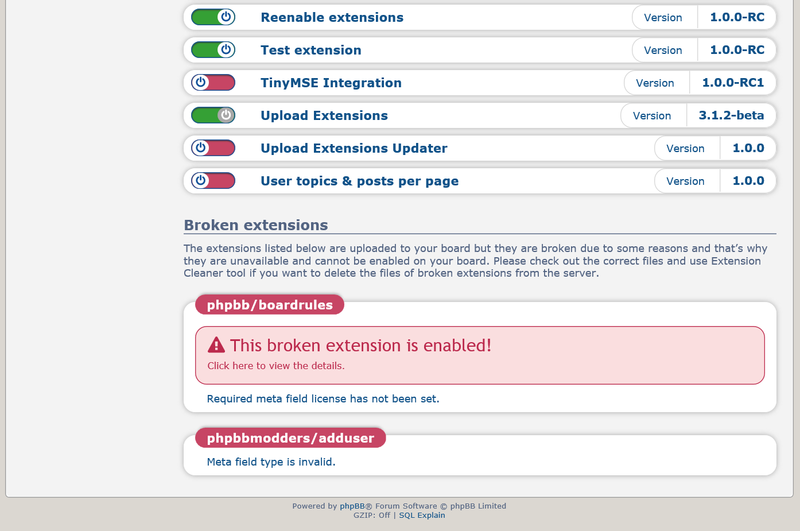 I don't think anyone would think: "oh this extension is for phpBB 1.0.0". And how is that different now? You have in the DB a list of which version it is for, so that does not defer from having it as version. You will however get issues if you want to bring more as 1 version for each phpBB version . Providing the right phpBB version in composer.json is the right way of doing it. Thanks for the extension. It will help a LOT of people who do not know or have problems grasping how to manually install mods! I've tested it with a few betas and have had no problems yet. Great job! We have jumped to a new repository and made some fixes. nice MOD, its function good. I have it translate in German. Where can i upload this file?